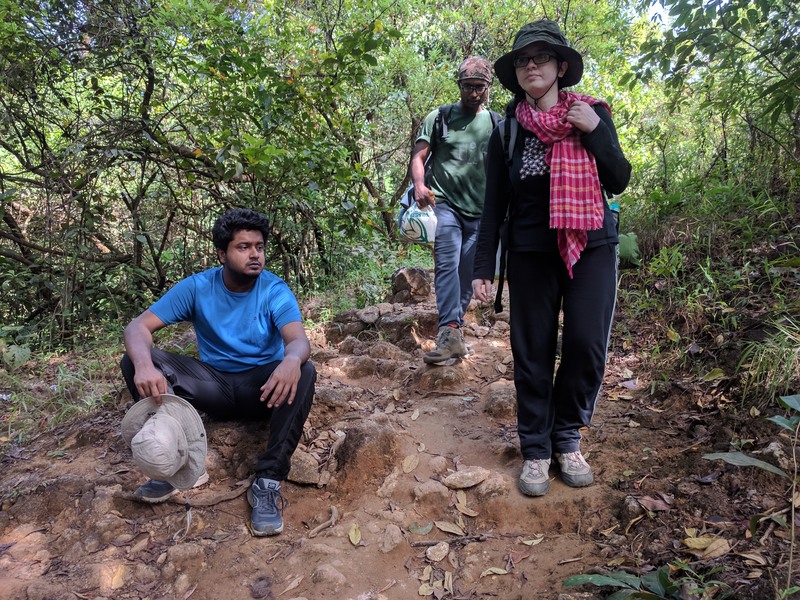 I was invited by my bandmates Korak and Shounak to join their gang from IISc for this trek. An upcoming trip of mine demands considerable fitness. I took up this opportunity to prepare a bit for the trip and test out few of my gears. Other than Korak and Shounak, I had the company of Mohini, Sujit, Bidisha, Yudhajit, Dipanwita, Arka, Atri and Anupam. Anupam was the only one who had done the trek before. 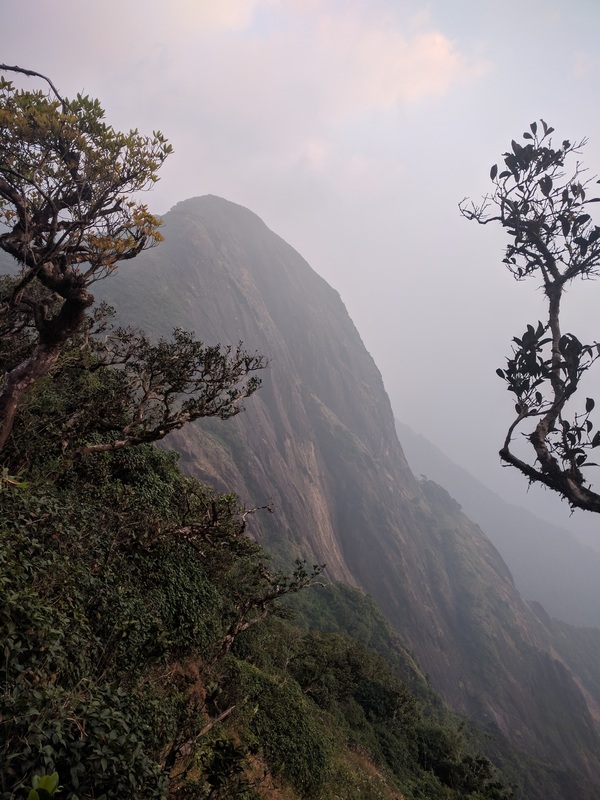 Kumar Parvat is the highest peak in the Pushpagiri range and is often considered as the toughest trek in the Western Ghats. 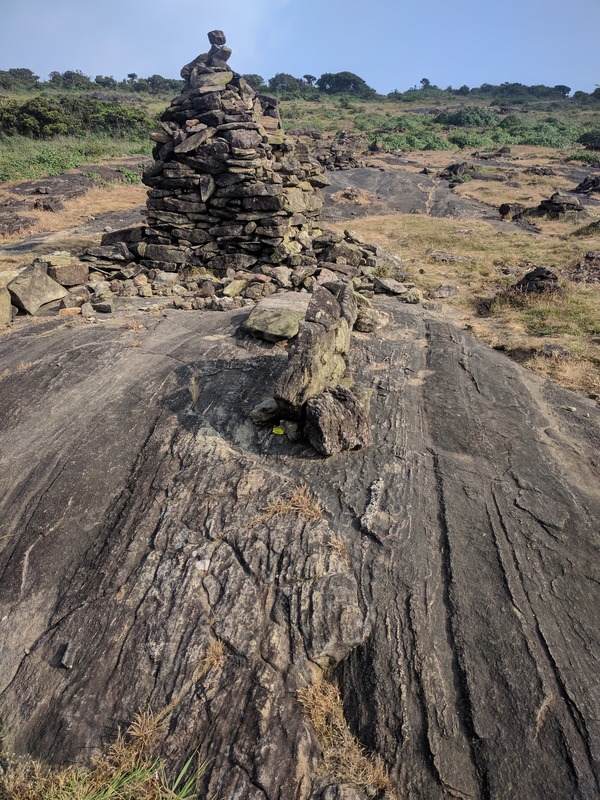 The peak has two access points — Beedahalli in the east and Gaddigere in the west. 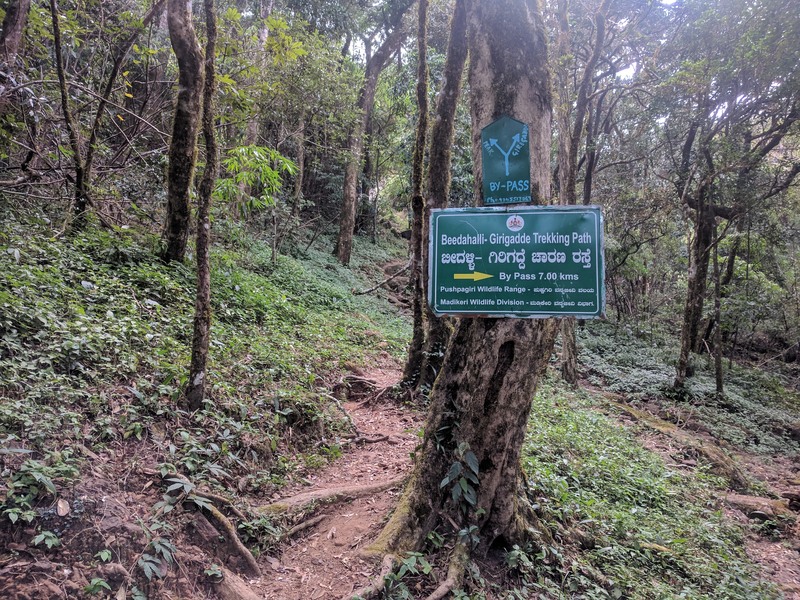 Beedahalli is accessible via a motor-able route in Kumaralli while reaching Gaddigere requires a trek through forests from Kukke Subramanya. 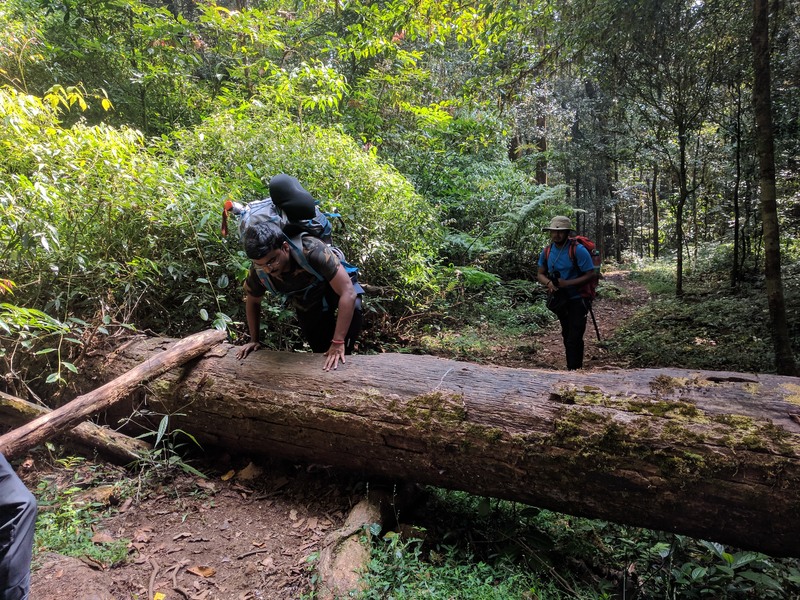 The usual trekker starts from Kukke Subramanya, carries camping gear, drops them at Gaddigere forest office, hikes with minimal gears to Kumar Parvat, returns back and camps overnight before descending to Kukke Subramaya the following day. This is also the drection that Anupam had taken in his earlier attempt. We had a slightly different plan. 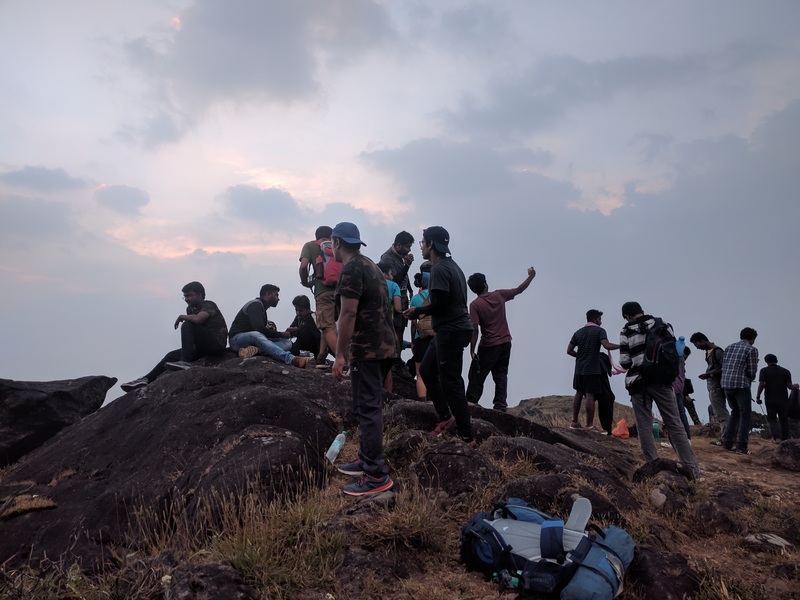 We wanted to start from Beedahalli, climb seven kilometres to summit Kumar Parvat, descend another seven kilometres to Gaddigere, camp overnight, before descending another six kilometres to Kukke Subramanya. 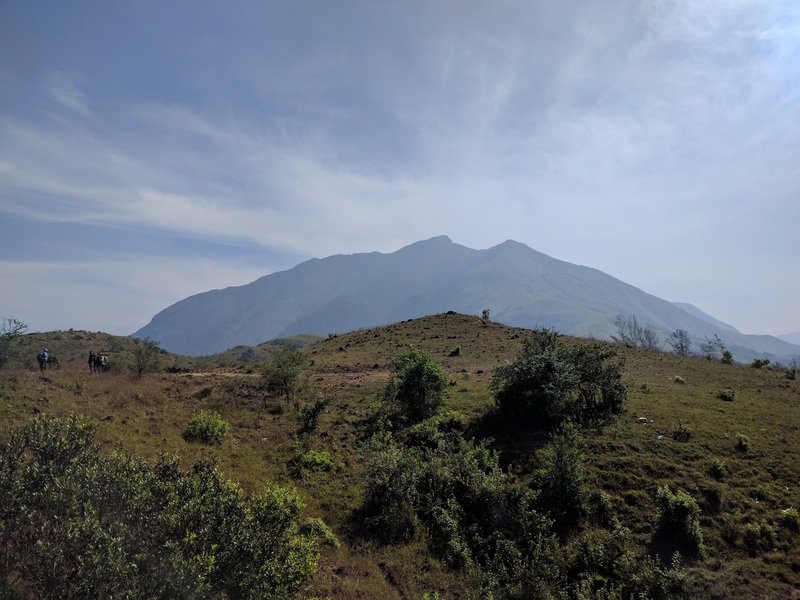 This meant we had to carry our camping gear throughout the duration of the trek. Our plan wasn’t without hiccups. We started off from IISc campus in a hired van at around 11:30 pm. We were at Kudrasthe, a junction town 23 km away from our starting point, by 5:00 am next morning. There wasn’t a single shop that was open. Not only did we need breakfast, but also had to pack our lunches. By the time we had finished our breakfast and placed our order for lunch at a local hotel it was quite late. Sujit, a seasoned traveller, paid a homestay 500 rupees to allow us to freshen up. By the time all eleven of us had completed our morning chores, it was already 10:00 am. A small breakfast joint at Kudrasthe where we had our food. We packed some stuff for our lunch. Dry fruits, chocolates, bananas, oranges, were distributed amongst all. Apart from this, each of us had to carry three to four litres of water with us. Then there were five tents whose load had to be shared. I volunteered to carry one to the summit with the intention of offloading it to someone else during the descend. Apart from that, Sujit and I shared the duty for carrying the lunch. 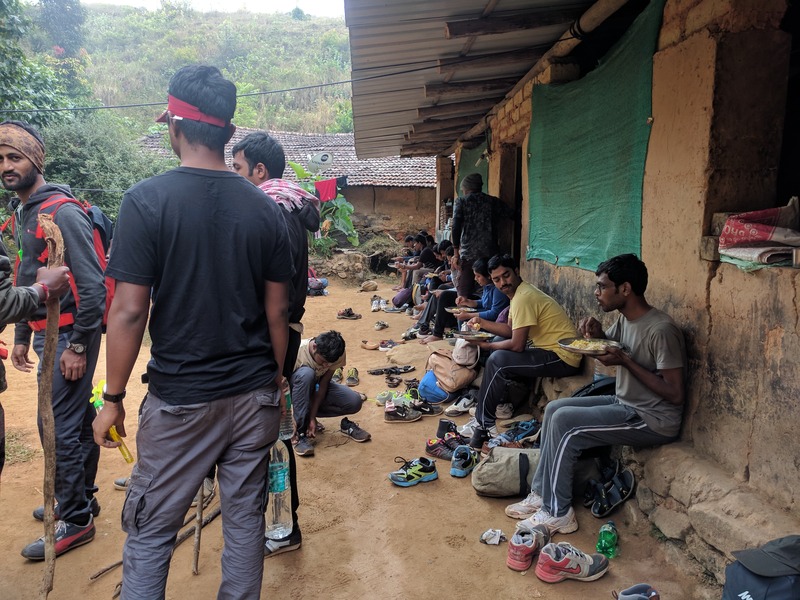 I think amongst all of us, Sujit was the one who had carried the most amount of stuff — he even had some mixtures and a large packet of puffed rice that saved us the next day. 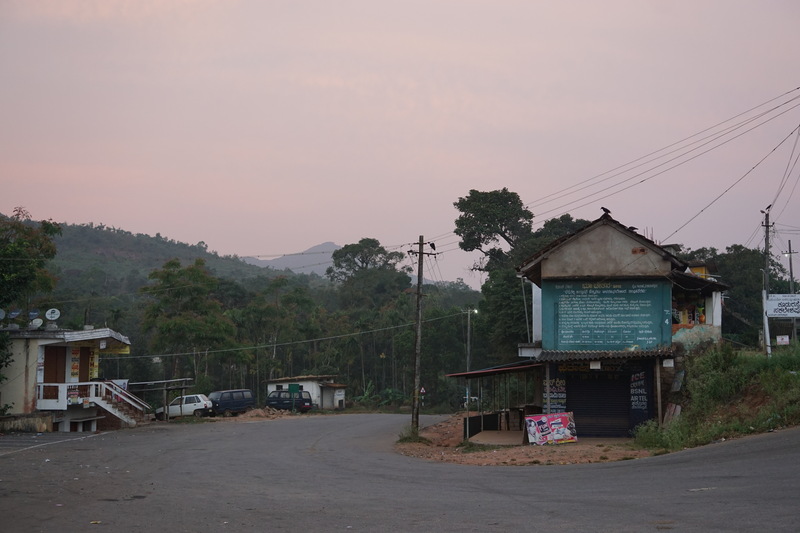 Beedahalli APC is about a kilometre upward hike from the last motor-able point — the place where our van had dropped us. We instructed the driver to wait for us on the other side at Kukke Subramanya the next day. 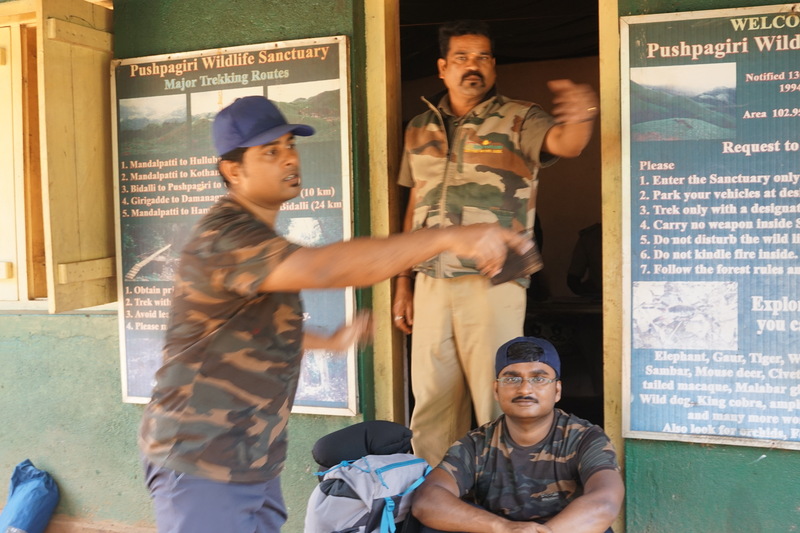 At the outpost, we were stopped by the forest officers who did not allow us to carry the tents inside. Camping is not allowed inside the reserve forest area. After some discussion, handled aptly by Sujit and Korak, they allowed us to carry the tents. 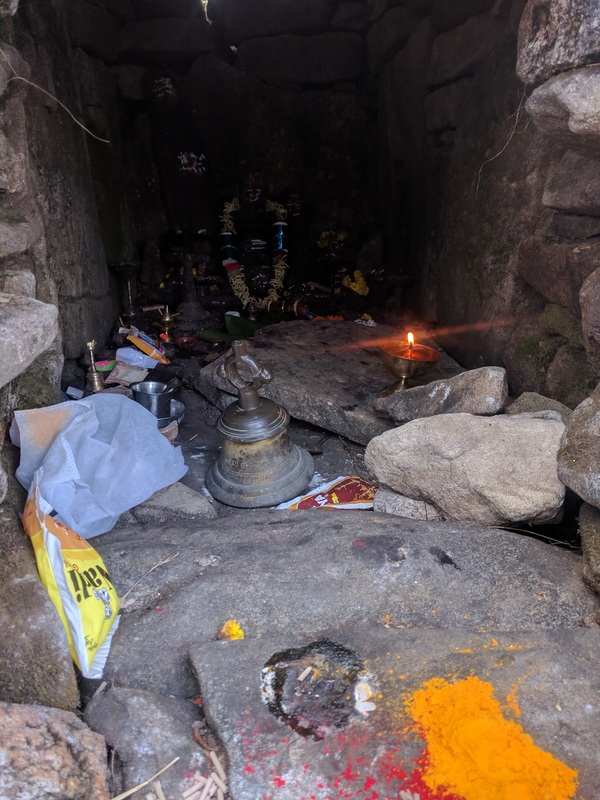 We had to deposit 4000 rupees, which they promised would be refunded on the other side only if we reach there before the end of the day (12:00 midnight). Failing to do so would not only result in loss of money but risk a chance of our tents getting confiscated by the patrolling officers. Korak taking some directions from the officer. By the time we had paid all the necessary fees (350 rupees per person) and were done with all these formalities, it was already 11:40 am. We were late. 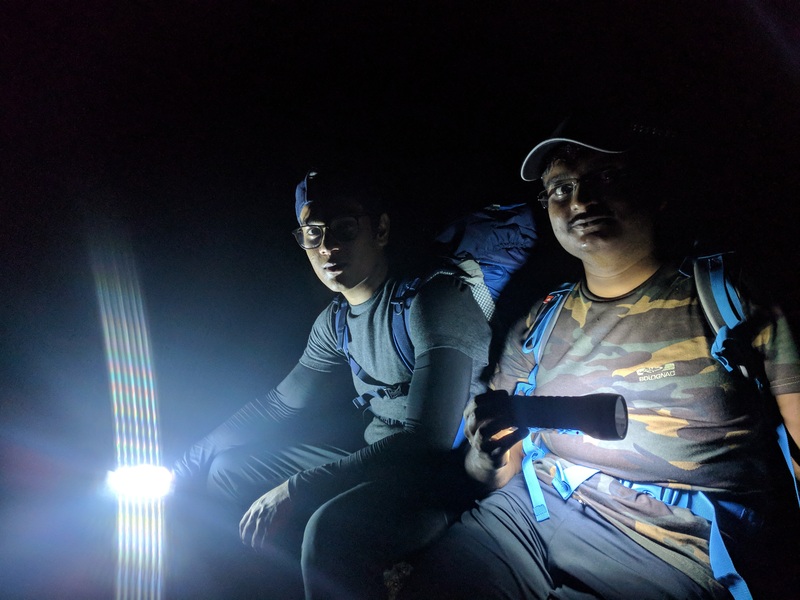 We headed into the forest knowing very well that we were in for a night trek. 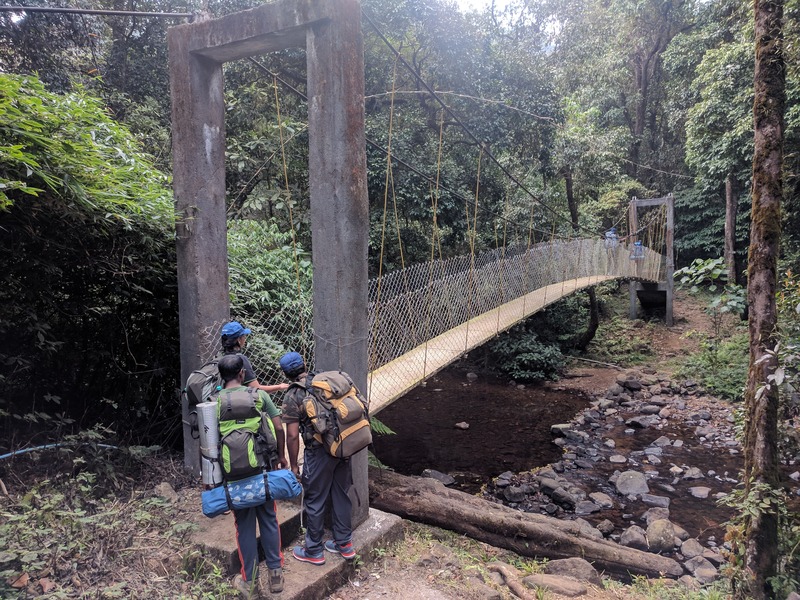 This bridge marks the start of Beedahalli APC jurisdiction and is the entry to the trail. The first five kilometres of the trail passed through sufficiently dense foliage. The shade of the forest sheltered us from the otherwise harsh sunlight of an overhead Sun. The rolling terrain made for an enjoyable walk. We covered this distance in two-and-a-half hours. Arka navigating a fallen tree trunk. 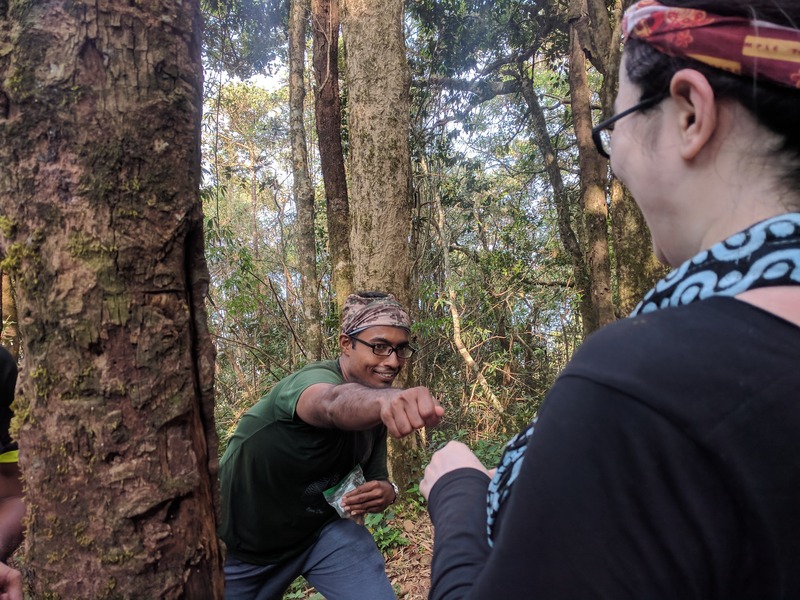 Sujit giving a fist bump to his wife, Bidisha. 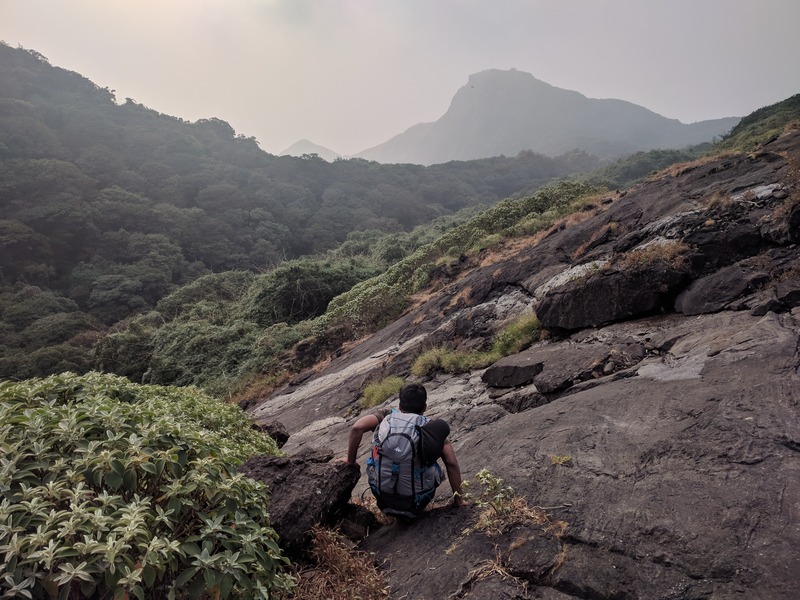 The two kilometre ascent to the peak was characterised by three walls — large monolithic rock faces that have an inclination of fifty to seventy degrees. The first one was the steepest. This was where Atri and Dipanwita’s shoes gave quite a lot of trouble. Both of them were wearing running shoes. Atri had stepped on some water which made his soles lose whatever residual grip it had. This was quite a treacherous situation for him. He was almost about to slide back down. He took of his shoes, handed them to his brother, Arka, and climbed up. He did not face any further problems in scaling the subsequent walls. Dipanwita later said that it wasn’t her shoes — she was simply scared. Personally, I think it would have been better to blame it on the shoes. Atri and Arka, the brothers, posed for a photograph midway while ascending wall number two. This marked the final stretch. The flat region of Kumar Parvat summit is visible in the background. By the time we reached the summit it was 4:00 pm. There is a small temple at the hilltop. We had our lunch — chitranna, eggs and peanuts. Yudhajit complained of a slight pain in his knee. Arka gave him his trekking pole. 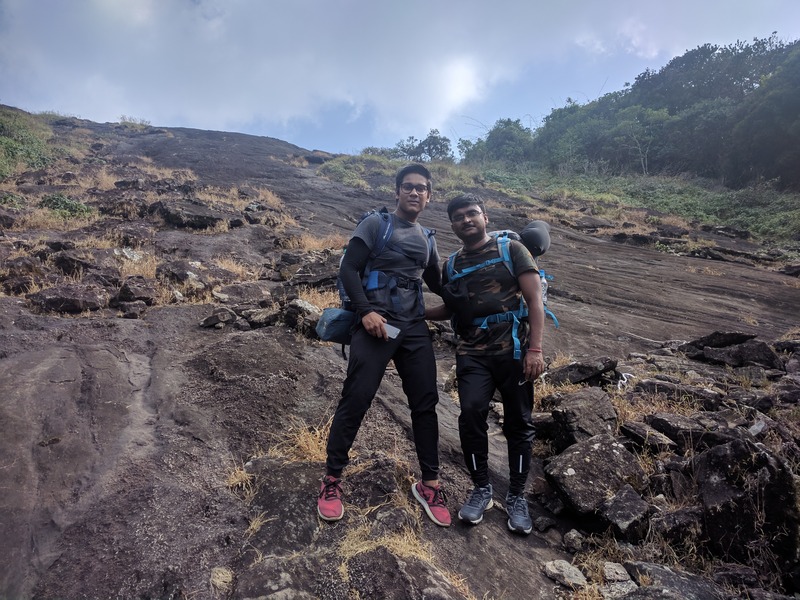 This and Anupam’s constant support throughout the following seven kilometres is what kept him going. Temple at the top of the hill. Back row L to R: Bidisha, Mohini, Dipanwita. Front row L to R: Sujit, Yudhajit, me, Athri, Shounak, Anupam, Arka. Trying to get out of the 2D plane: Korak. 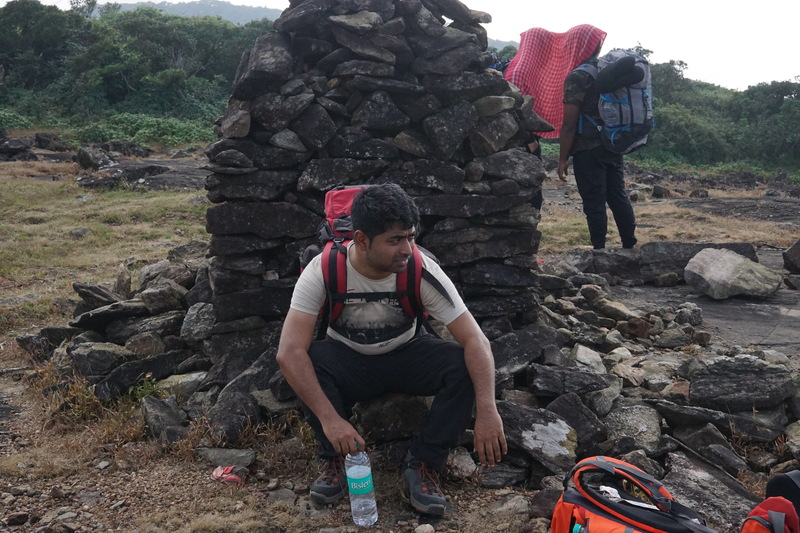 We hit a fourth wall immediately as we were getting down the Kumar Parvat summit. 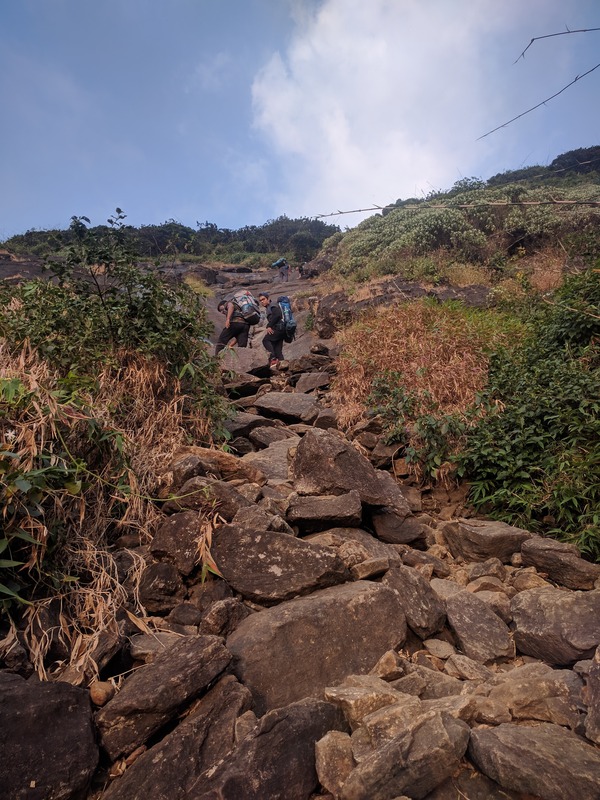 Atri made me realise why most people preferred the trek from the other side — this was the steepest of them all. With wet patches on the face, it was the most treacherous of the four. Carefully, I slid along the slope and quickly descended the steep rocks. Arka and Atri followed. We waited for the others to catch up. Guys and girls had a very hard time. With Anupam and Sujit’s help everyone was able to get down safely. The single steep wall on the other side was a challenge. The photos don’t do justice to the gradient of the surface. Or maybe this one will put things in perspective. The trail towards Gaddigere passes through Shesha Parvat summit. We enjoyed the breath-taking, near-vertical drop of Kumar Parvat amidst a setting Sun. 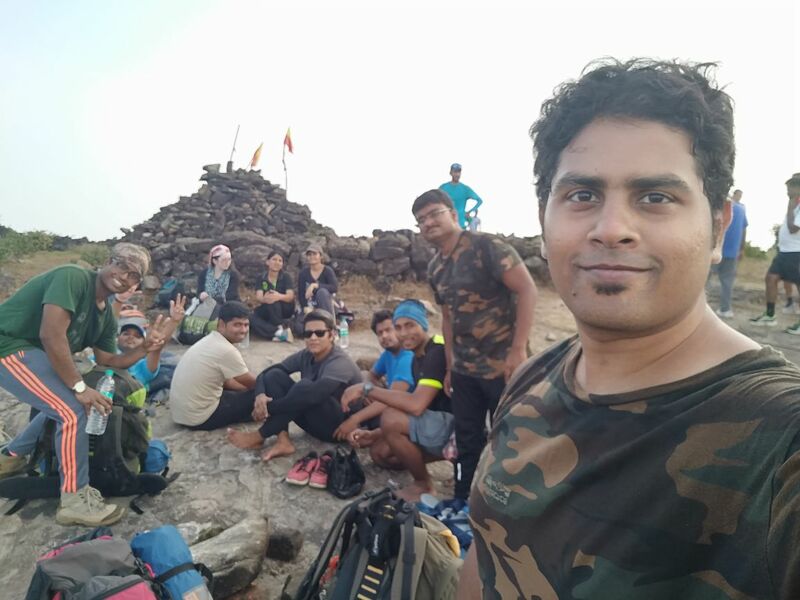 Apart from us, there were three more groups on the top of Shesha Parvat. Darkness descended swiftly. We all took out our torches. Dipanwita’s dynamo torch failed to function. Shounak’s Chinese torch functioned poorly. As a result we were two light sources short. I clipped on my lamp to my rucksack’s chest strap and continued the descend. The gradient was about one-to-five. I was descending quite rapidly when compared to the rest of the gang. Whenever, I felt like I had gotten too far, or someone called for me, I halted and waited for others. There were a few places where I had waited for quite some time — anywhere between half an hour to an hour. I could see two more clusters of LED lights further behind our group. We weren’t the last ones. Arthri and Arka waiting for the others to catch up. The descent felt long, really long. The steep steps made my knees hurt. These waits were my excuse to rest the impacted knees. Whenever I stopped, I switched my lamp to a red LED to preserve battery charge. Later, I got to know that Anupam had used the red light as anchor for guiding and motivating the others. I did not know this. As a result, whenever the guys got closer, I continued to descend. From their perspective, I looked like an elusive red dot that moved further away as they got closer. Somewhere near Kallina Mantapa (a.k.a. 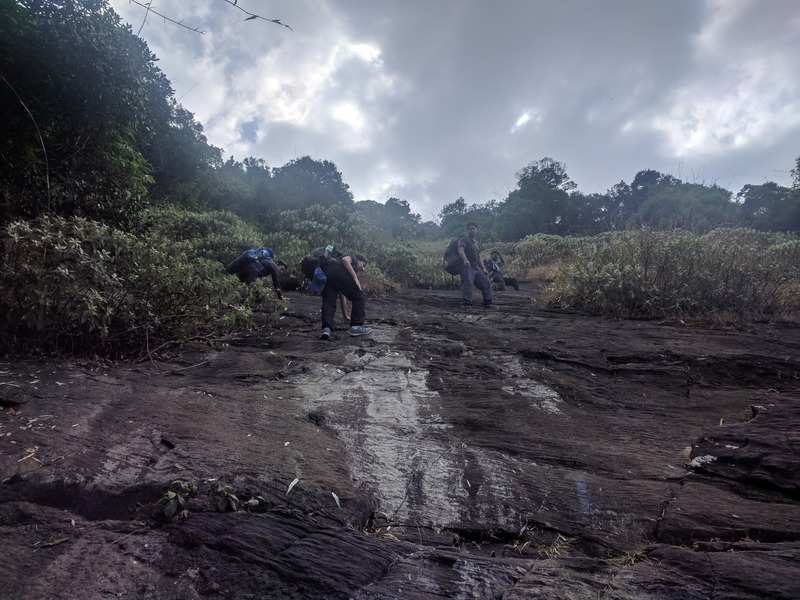 Kallu Mantapa), about two-thirds into the descent, while I was waiting for the group, one of the groups from an adventure travel company based out of Bangalore overtook us. The atmosphere had also become quite chilly. I took out my jacket and put it on to protect myself from the cold of evaporating sweat. We must have walked a lot. We must have rested a lot too. By the time we reached the View Point, it was already 10:00 pm. People were exhausted and lagged behind. I shooed away the sharp pain in my knees that came from descending steep stairs — essentially, I was doing back to back pistol squats with weights on my back. About six of us had reached the view point. The rest were escorted by Anupam. While we waited for the others to at the benches of the view point, the last group caught up to us. They were forest rangers. They asked if we were all right and if we could get to Girigadde on our own. With an affirmative nod from our side, they moved ahead. Me enjoying the chilly wind at view point. Shounak and I walked ahead to reach the forest office. Thankfully, they returned the deposit on showing the receipt. 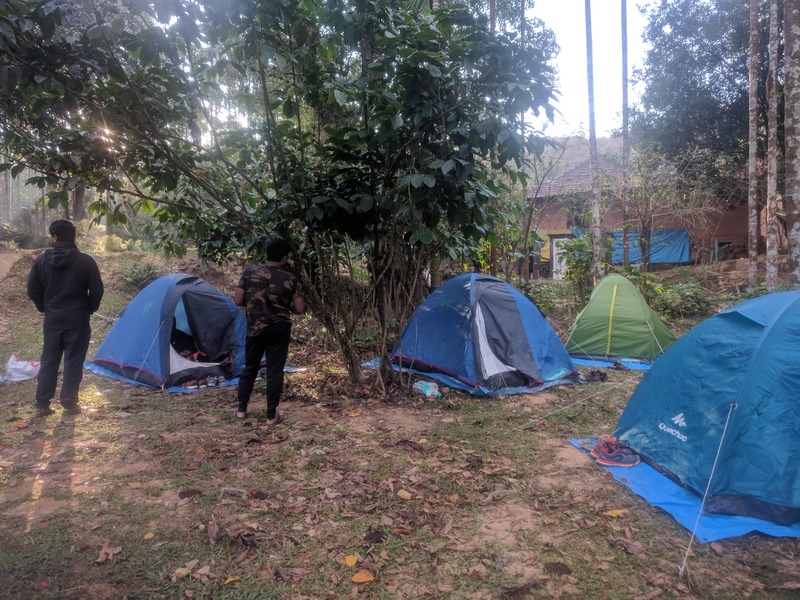 The forest officer also warned us not to carry tents through the reserve area again. One would find a small isolated house owned by Mr. Bhatt (Bhattara mane) some hundred metres below the Gaddigere APC. He provides restroom facilities, camping space, shelter and food to trekkers. 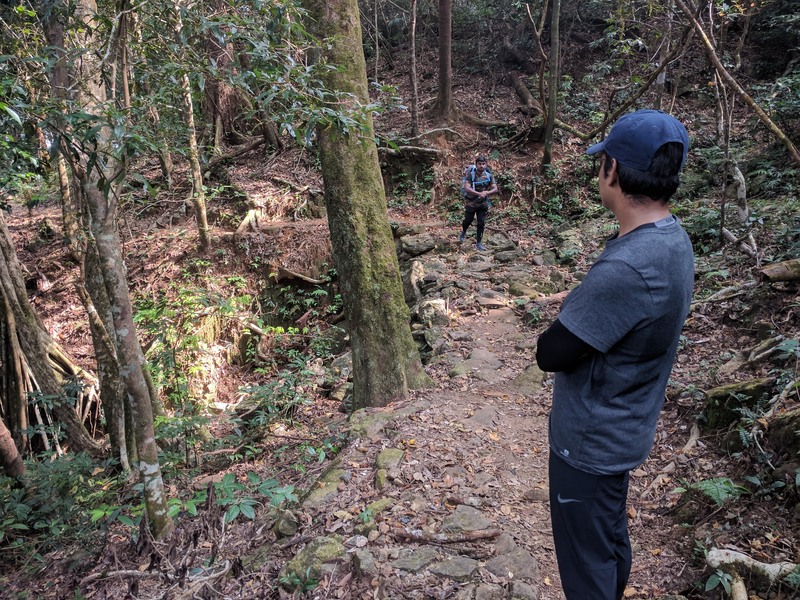 We had failed to contact him directly and had asked a forest official as well as the team from Bangalore Mountaineering Club to inform him of our arrival. Neither of them did so. Needless to say, we had no food after the trek. 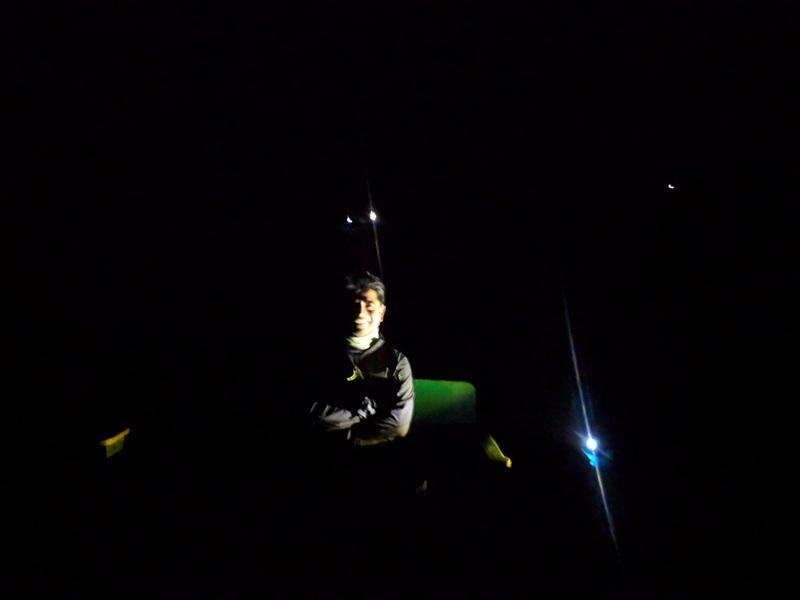 At 12:00 am midnight, while we were busy setting up our tents, Mr. Bhatt called us. He had some surplus food. We all gulped down the rice and sambhar like it was the best food on the planet. Our camping ground at Bahattare mane. 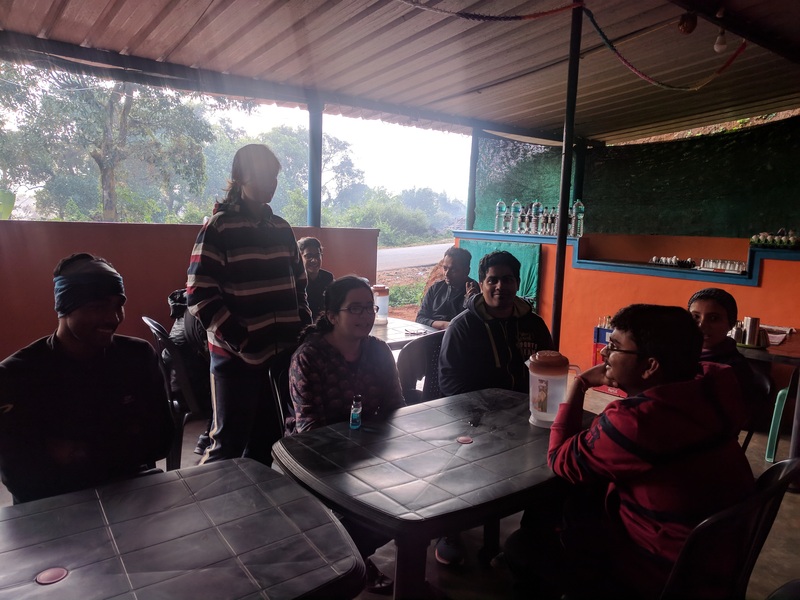 Trekkers having simple, tummy-filling breakfast arranged by Mr. Bhatt. Next morning, after freshening up and finishing our breakfast at Mr. Bhatt’s place, we walked down towards Kukke Subramanya. One last look at the range before our views were obstructed by the forest foliage. 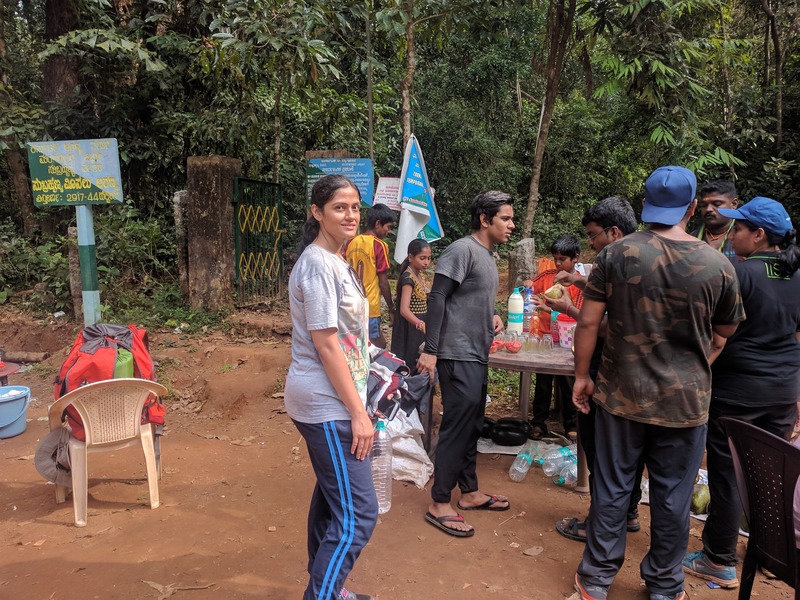 Somewhere along the way, Anupam and Sujit prepared a killer mixture of puffed rice with spicy mixture, raisins and peanuts. This was the battery that not only fuelled our descent but also helped us in suppressing our hunger before we could get to a proper restaurant. The descent was swift and nice. Once we were inside the forest, the slope became gentler. The girls — Bidisha, Mohini and Dipanwita — were quite tired. On the other hand, a good night’s sleep had helped Yudhajit recover quite a bit from his discomfort. Shounak taking a break with Sujit and Bidisha joining him. We were done with the trek at 2:30 pm. This is the access point on the Kukke Subramanya side. The guys have all flocked to have some coconut water. A tired Dipanwita smiles for the camera. After some freshening up, we headed back to Bangalore. En route we stopped at Surabhi’s Pushpagiri Bar and Restaurant in Sakleshpur for our dinner. We were so hungry that everyone submitted themselves to the akki rotis, crispy silver-fish fries, kadai chicken, mutton hundi, mutton perrper dry, mutton and chicken sukkha and mutton, chicken and prawn ghee roasts. I don’t think anyone took a single photograph.